Even in the harshest conditions, the ASSA ABLOY UltraTough performs like no other door. The ASSA ABLOY UltraTough meets the demands of any environment with a choice of two drive units: the Springless System and Counterbalance System. 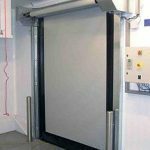 Whatever you choose, this door helps reduce energy costs, increases productivity, and creates a better working environment.